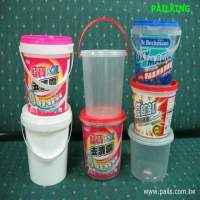 New Patent EZ Folding Lid Detergent Pail! Easy to open, easy to use, easy to close! The lid provides excellent sealing, or oil-seal can be added.